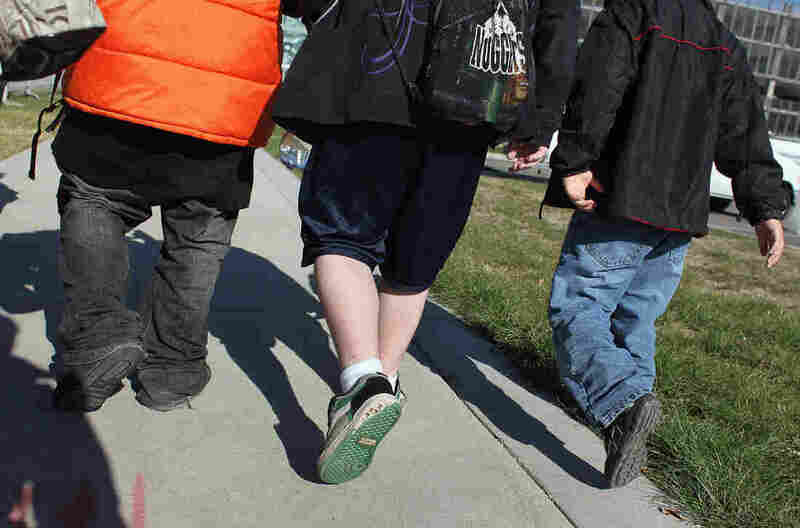 Illnesses Linked To Obesity May Be On The Rise Among Kids : Shots - Health News A new analysis of U.S. health insurance claims is worrisome, pediatricians say: More and more young people are being diagnosed with Type 2 diabetes, high blood pressure and sleep apnea. Whatever their size, kids and teens benefit from exercise, abundant research confirms. And exercising with friends is almost always more fun than on your own. It's no secret that American children have gotten heavier in recent decades. Now an analysis released Thursday by the nonprofit Fair Health, a national clearinghouse for claims data, joins earlier research showing the consequences of that extra weight. The study found a sharp rise in health insurance claims filed on behalf of young people who have high blood pressure, Type 2 diabetes, sleep apnea and other conditions more typically associated with older adults. Claims for Type 2 diabetes — formerly known as adult-onset diabetes — among people younger than 23 years old more than doubled between 2011 and 2015, according to the analysis of a large national database of health claims paid by about 60 insurers. At the same time, claims for prediabetes among children and youth rose 110 percent, while high blood pressure claims rose 67 percent. Sleep apnea, a condition in which a patient temporarily stops breathing while sleeping, rose 161 percent. The findings "not only raise quality-of-life questions for children, but also the ... kind of resources that will be necessary to address this emerging situation," said Robin Gelburd, president of Fair Health. The company offers free medical cost comparison tools to consumers, and sells data to insurers and health systems. Fair Health's analysis is certainly not the first to note a rise in obesity or Type 2 diabetes in this age group, nor does it explore the possible reasons behind the apparent increase in claims. One factor in the rise could simply be an increased awareness of the problem and testing for it, while variations among states could reflect differences in patient ethnicity, how doctors practice, insurance rules or all those factors. "We try to give a big picture," Gelburd said, "and welcome others to look under the hood for details." But the analysis is different from some earlier research in that it uses a database of actual health insurance claims for about 150 million people, all of whom have private insurance. The study focused on a subset of youth: those who had a diagnosis of obesity or Type 2 diabetes. Researchers analyzed claims data tied to those patients to determine what other conditions they experienced and the medical services provided to them. Claims data is considered a good research tool because it reflects services actually provided. But, conversely, the Fair Health analysis is also limited because it does not include health claims submitted by Medicaid or other government programs, so it doesn't represent a true cross section of the population. Still, even with those limitations, the findings "are frightening," said Dr. Stephen Pont, a pediatrician and medical director of the childhood obesity center at Dell Children's Medical Center in Austin, Texas. "The vast majority of kids should never have high blood pressure or diabetes or sleep apnea," said Pont, who was not involved in the Fair Health analysis. "Now we're seeing those consequences in kids. That will result in shorter lives and lower quality of life." The solution cannot be found solely in the doctor's office, he added, but most health insurance companies don't cover weight management programs until a complication such as high blood pressure is developed. To keep the Fair Health statistics in perspective, it's important to note that Type 2 diabetes only affects a small number of children. The Centers for Disease Control and Prevention estimates that only 0.25 percent of all children have the condition. But when it does hit, patients must go on medication, often for life, and can experience serious health problems, including blindness and kidney failure. The Fair Health analysis found that, during the four years analyzed, the number of claims tied to an obesity diagnosis jumped 94 percent among infants and toddlers, and as much as 154 percent among people ages 19 to 22. States with a high prevalence of claims for Type 2 diabetes included Ohio, Pennsylvania, North Dakota, Utah and South Dakota. That geographic variation surprised some outside researchers. Some states on the lower end of the scale were surprising, too. Louisiana and Alabama, for example, appeared to have a lower number of claims for Type 2 diabetes than many other states, despite generally appearing at the bottom of state rankings across a variety of health measures. "How does one interpret the difference between a low-claim state like Louisiana and a high-claim state like Ohio? Something is happening here," said Dr. Dennis Bier, professor of pediatrics in Houston at Baylor College of Medicine, who was not involved in the research. "Does that mean doctors in Louisiana are not making enough claims for diabetes?" Gelburd noted that the analysis didn't have access to ethnicity or socioeconomic data, so those were among variables not factored into her team's analysis. How demographic and other variables impact the findings is worth exploring further, said Bier. Has there been a sudden change in the development of Type 2 diabetes? Or, conversely, does the uptick in the Fair Health data reflect a change in medical practice or awareness of the condition? Perhaps there are state insurance rules in one state that require more medical coverage for obesity than others, driving the differences. But no matter the underlying causes of the increase, Bier said it is well known that the longer children remain obese, the more likely they are to get diabetes. Chiefly, he said, the country needs to find more effective ways to prevent obesity from occurring in children in the first place. And, he notes, that's difficult. "We're pretty poor at getting people to change their behavior."